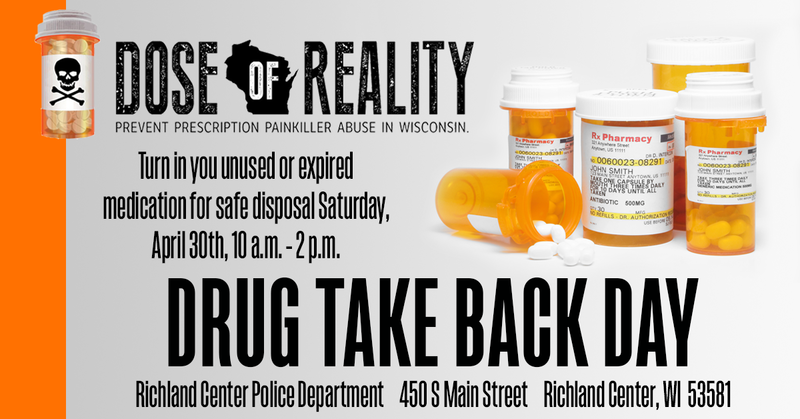 On April 30, 2016, the Wisconsin Department of Justice (DOJ) will coordinate a Prescription Drug Take Back Initiative throughout Wisconsin. 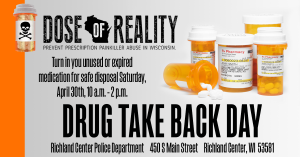 The Prescription Drug Take-Back Day goal is to provide a safe, convenient, and responsible means of disposal of prescription medications, while also educating the general public about the potential for abuse of these medications. Unused prescription medications in homes create a public health and safety concern, because they can be accidentally ingested, stolen, misused, and abused. On Saturday, April 30, 2016, participating law enforcement agencies can host one or more collection sites at locations and times of their choosing. Law Enforcement agencies do not need to host a take-back event in order to participate in this program. Agencies offering a permanent drug drop box can turn over the collected drugs to DOJ for disposal. Do Not Bring: Illegal drugs, needles/sharps, inhalers, aerosol cans, bio-hazardous materials (anything containing a bodily fluid or blood), mercury thermometers, personal care products (shampoo, soaps, lotions, sunscreens, etc…), household hazardous waste (paint, pesticides, oil, gas).